Most accounts involving Florida's roadways are tales of some unimaginable and appalling tragedy, like humans eating other humans on the side of the road. This isn’t one of those stories and while the topic of having babies in a car isn’t very newsworthy in terms of gore or motoring-awesomeness, there is a beautiful irony to it all; a highway gives way to a new life at the hands of a witness to the brutality of that same highway. The Story: The Florida Highway Patrol posted the following message to their website last month about a Trooper delivering a baby while investigating a crash. On September 24, Trooper Dennis Rich of FHP’s Troop C - Tampa District was investigating a traffic crash, eastbound Interstate 4 between Hillsborough Avenue and US Highway 301. While investigating that crash, a westbound motorist stopped in the center median for help. The driver and his wife were headed to St. Joseph’s Hospital for the delivery of their new baby. The baby wasn’t waiting. The trooper was spotted nearby and was called upon to help. 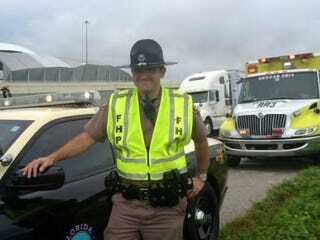 Trooper Rich immediately responded and moments later helped deliver a healthy baby girl. Soon thereafter, all were assisted by Hillsborough County Fire Rescue and later transported to the hospital. Yes, great job Trooper Rich. Now, get back to chasing people-eating zombies and Canadians doing 40MPH along the Sunshine State’s beautifully flat highways. As alluring as it may sound to have your son or daughter born in your car, both from a cost-savings and automotive enthusiast perspective, my advice: let medical professionals handle the delivery of the heir to your motoring collection and let the State Troopers focus on mobile meth labs and rolling pharmacies.